I'll have my 2015 preview shortly. In 2014, as I wrote in my annual preview, the first Atlantic Yards tower would open, the cozy relationship with the mayor might pay off, and the Greenland deal and the court-ordered Supplementary Environmental Impact Statement might change the timetable, though it was uphill. Well, I was partly right. But Atlantic Yards is a "never say" never project. The B2 tower didn't open--it wasn't yet public how many problems had surfaced with the modular factory and modular plan, which stalled the building at ten of 32 stories. The problems also led to dueling lawsuits, the announcement that the next towers would be built conventionally, and Curbed's designation of B2 as the "most pathetic building of the year." And the first tower built by the partnership launched in December with huge fanfare and the dubious claim of "Brooklyn's newest neighborhood." There was a gesture to new oversight, but also with significant caveats, since the Atlantic Yards Community Development Corporation has merely an advisory role and delayed more than a month. While public officials, like new Council Member Laurie Cumbo, have fallen in line with the "affordability" mantra, while Public Advocate Letitia James, the most critical official (as Council Member), has mostly focused on other issues. Acceptance of the project grew among elite circles, as the Municipal Art Society awarded Forest City leaders Bruce Ratner and MaryAnne Gilmartin the organization's highest honor, not without criticism. Indeed, de Blasio pushed Brooklyn and the Barclays Center for the 2016 Democratic National Convention, and it's a finalist along with two swing state cities, Columbus and Philadelphia. And the settlement agreement took BrooklynSpeaks and allied groups, some of the most vocal and organized critics of the project, off the table, now claiming victory despite the significant flaws. The main critics now remain the project's nearest neighbors, who bear the brunt of construction. 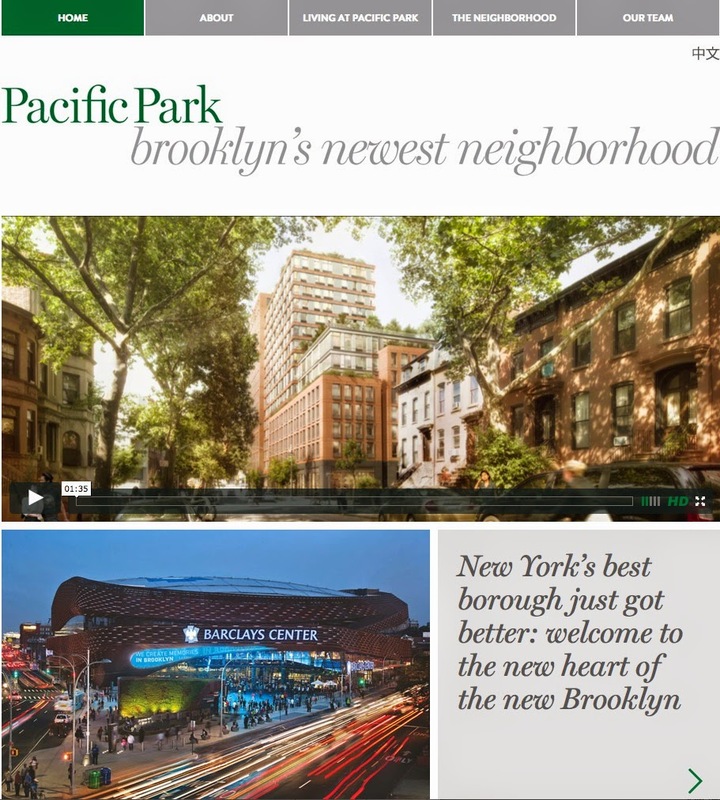 There was a different surprise: the decision by Greenland Forest City Partners to change the project name to Pacific Park Brooklyn. Another surprise was the decision to install a green roof--positioned as beautification--to tamp down the nagging problem of escaping bass. That means there are three cranes outside the arena. The Brooklyn Nets, after retooling for a short-term shot at a championship, were on a rollercoaster with new coach Jason Kidd, I wrote. Kidd left, but the rollercoaster has continued, with the Nets going downhill, then recovering after playing high-priced stars Deron Williams and Brook Lopez from the bench. Oh, and Forest City, after putting their 20% share of the Nets up for sale, is now selling their 55% of the arena--possibly only in part. The arena has certainly made a splash, but profits are still behind schedule. And it's not a core business. Narrowed Carlton Avenue north of Dean Street. Changes have continued on blocks around the arena, with the arrival of a new Shake Shack and Doughnut Plant, the departure of Let's Yo! on the arena's Flatbush flank, and the advent of a studio for WPIX. But the coveted Triangle building at Fifth and Flatbush avenues is still empty and there's been lots of churn among storefronts. B2 modules weren't delivered for two weeks. Which meant the official launch was a media event. GQ gets a lot of attention for opening Barclays Center barbershop. AYR reports on Forest City CEO Gilmartin claiming that modular buildings mean "the modern redux of Jane Jacobs." An eight-story residential building is planned on Pacific Street, filling in a gap next to B15. Bruce Ratner buffs supporters after he's honored at tickets giveaway. For five nights, railyard lights are on. Document reveals Greenland, Chinese investor, will control Atlantic Yards. The Nets are now the fifth most valuable team in NBA, at $780 million. But only a handful of spectators attend a local women's college hoops game. Forest City is going back to China for EB-5 funds; Chinese government would profit by selling U.S. green cards to Chinese! Questions pile up. Evidence suggests previous EB-5 raise used to retire high-interest loan. Dubious use of bridge financing now mainstream. Backlash against EB-5 in federal audits. AYR explains how New York State helped Forest City's first EB-5 efforts. In City and State, Ratner rises to #43 on the Power 100 list; Lewis enters at #42. Gilmartin new co-leader at Downtown Brooklyn Partnership. The irony of an Amnesty International concert at Barclays Center. "Ratner yanks big event at Barclays due to planned protests." New leaders: Been at HPD, Weisbrod at City Planning. Nets schedule exhibition games in China, connected to EB-5? Greenland, Forest City's new partner, plans $10B investment abroad. De Blasio at REBNY, promises "to use height and density to the maximum feasible extent." Stunning tales of Downtown Brooklyn real estate boom; is Junior's site worth $50M? Lease for 470 Vanderbilt, across from AY site, sells for nearly $200 million. State won't look at post-event pedestrian surges, impact of roof revamp. New arena acoustical panels part of three-way effort to limit escaping bass. Still doesn't work. Recurring complaints about circus load-in, errant trucks. Report: Barclays Center traffic impact not as bad as feared. Locals say Nets games not worst scenario. For Brooklyn Nets, 15,000 home fans is fine. In New Jersey, it wasn't. Forest City says Greenland deal to cost only $148.4M net of tax. If season ticket prices are the same, how can they "start at $45 per seat"? Columnist Hamill misremembers Ratner's ticket promises. Gilmartin claims Forest City is "besieged" with interest from other developers considering modular construction. SEC filing: Forest City admits Greenland is already steering some Atlantic Yards decision-making. Bertha Lewis now opposes waste transfer station. Barclays Center mystery meditation room gets spruced up. Times takes whimsical page 1 look. Unseemly Ratner alliance with Silver and Rapfogel. As Rapfogel pleads guilty, some potential Forest City connections left a mystery. What would Jackie think? MAS giving Ratner and Gilmartin highest award, the Onassis Medal. But they don't fit most MAS goals. Prokhorov tries to move Nets under a Russian company then backs off. Plan for Community Use of Barclays Center emerges. Though no events scheduled in 2014. Green roof planned for Barclays Center. Forest City claims noise complaints didn't play a role. As expected Draft SEIS says extended buildout no big deal outside immediate blocks. Routine board approval marred by neighbors’ criticisms, director’s reservations. Modular construction said to mean 22% drop in costs/wages. Work on B2 clearly slows. Times scoop: Greenland plans next three towers this year via conventional construction. 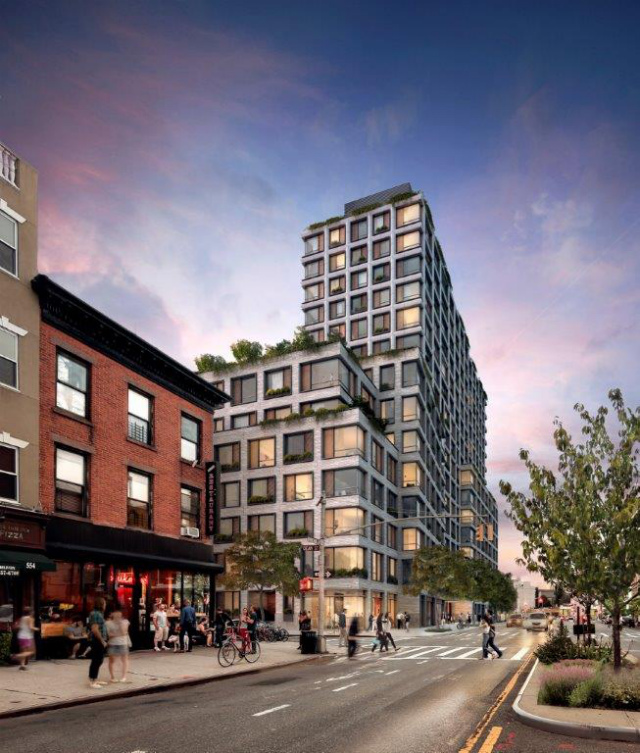 Community Board 8 expresses strong opposition to CB 2's attempt to encompass Atlantic Yards. Forest City says Corporate Social Responsibility report leads to "intangible value" boost. Draft SEIS says Forest City "generally" in compliance with environmental protocols. Atlantic Yards housing not permanently affordable; units in first tower would last 35 years. First paradox: multiple developer alternative seems impractical--because the state changed the rules for Forest City. Second paradox: the footprint area doesn't count for "neighborhood character," but it sure did for blight. Once promoted, project open space has delays/deficits minimized. Before hearing, Forest City discloses plan to accelerate elements of platform construction, delay permanent railyard. As Nets' value rises, Ratner to put 20% share up for sale. Investment banker thinks Brooklyn Nets worth $1 billion. At hearing on environmental review, some surface consensus on timing; electeds call for new oversight, including of impacts; housing partner hints at de Blasio boost. DDDB: state goes through "extreme mental gyrations" to avoid analyzing alternatives. BrooklynSpeaks on Draft SEIS: "the pretzel logic of a government bureaucracy serving the interests of an influential developer". Delayed construction means Atlantic Yards surfs gentrification, rather than stem the tide. Nets' second season surpasses debut year, but second round loss. As de Blasio announces affordable housing plan, Atlantic Yards (delay, modular, lack of neighborhood planning) remains an awkward backdrop. Forest City's strategy in trainees' lawsuit? Blame BUILD/Caldwell & emphasize distance. Assemblyman Mosley introduces bill to authorize Atlantic Yards Development Trust. Ratner re-invests in Cuomo, DiNapoli; Forest City gives to Democratic slush fund. Sequence suggests Ratner donation to D'Amato PAC was routed to Nassau County executive. Reality warp: judge in eminent domain case agrees Atlantic Yards site would've been upzoned; ESD claimed there'd be no changes without project. Orwellian, almost: Student winners of arena tour must write essay, "What's the best thing about the Barclays Center?" Atlantic Avenue to be constricted 21 months for work on green roof, West Portal. Mayor de Blasio proposes Barclays Center as site of 2016 Democratic convention. In exhibit, architect, redistribute bulk from Dean Street, revise open space; a "preposterous amount of square footage"
Though state claims construction oversight successful, promises new monitoring by outside firm, new procedures. Press release for award buffs Ratner and Gilmartin. Selective memory, glitzy gala, and enduring dismay. MTA uneventfully approves Forest City's proposed changes to Vanderbilt Yard plan. Nets announce training facility on roof of Sunset Park. The Times got used. FAQ on new Atlantic Yards housing deal: how 65% of units in two all-affordable towers would go to $100K+ cohort. Some $250K for tenant protection. Deputy Mayor Glen finesses change in affordable housing. Nets coach Kidd leaves for Milwaukee, returns to the tabloid back pages. Team losses larger than previously thought. Ratner joins de Blasio's Mayor’s Fund to Advance New York City (as he did with Bloomberg). Modular flap: loose panels on Dean Street facade of some B2 modular units swing and clang with the breeze. After costly season and flurry of change, Brooklyn Nets rebuild at somewhat lesser cost. Ten years after Downtown Brooklyn rezoning, celebration of success (despite failure to build office space), and new public investment to enhance livability. Evercore (not without conflicts) touts Forest City joint venture with Greenland as "certainly a positive" (but murkiness remains). Rapfogel sentenced to 3 1/3 to 10 years in prison; questions remain unanswered about Forest City connections. Fortune dissects EB-5: "The dark, disturbing world of the visa-for-sale program." Looking at agreement for affordable housing and public oversight. What the Times got wrong. In buildout, four of next six towers market-rate? Atlantic Yards rebranded as "Pacific Park"! Greenland charges into Brooklyn and beyond. deBlasio touts 2016 DNC in Brooklyn. Some challenges go unmentioned. Shake Shack opens on Flatbush. My article: "When ‘Affordable’ Rents Push $3,000"
My essay: "After 11 Years of Controversy, Atlantic Yards Becomes Pacific Park Brooklyn". Bitter dispute between Forest City and Skanska over cost overruns stalls work at B2 modular tower. 550 Vanderbilt and a distorted neighbor. Playing with perspective: renderings suggest new 18-story tower (smallest of all) almost harmonizes with row houses. 550 Vanderbilt rendering skewed. Skanska, Forest City, file dueling lawsuits over modular delay. Electeds back Forest City? Forest City asks judge to reopen factory. Venerable Church of the Redeemer across from Site 5 sells for $20 million. Getting closer to Greenland: Brooklyn BP Adams, pushed by Forest City to meet with new partner in China, finally met in Brooklyn. As judge denies Forest City's request to reopen modular factory, contract with Skanska to build B2 terminated. At dinner for Sharpton sponsored (in part) by Forest City Ratner, Cuomo, de Blasio, others fawn. Forest City Enterprises buys out Arizona Retirement System, 75% equity partner in stalled B2 tower. Lender for B2 has suspended disbursement. Will Islanders deal bring state additional rent? NBA team values skyrocket thanks to new TV contract. Forest City selling Downtown Brooklyn site for far more than it'll pay for Vanderbilt Yard. In China, Nets' visit boosts "Atlantic Yards III": deceptive pitch for cheap financing from Chinese millionaires seeking green cards under EB-5. U.S. State Department protests use of official in marketing "Atlantic Yards III" EB-5 investment to Chinese, gets mention cut from promotion. Former ESDC head "Ambassador" Gargano, "classy political opportunist," now a leader of EB-5 firm promoting Atlantic Yards investment. His boss's "tangled past" dissected in Fortune. Is Greenland Forest City now promoting condos to buyers in China? On-site Environmental Monitor finally hired. 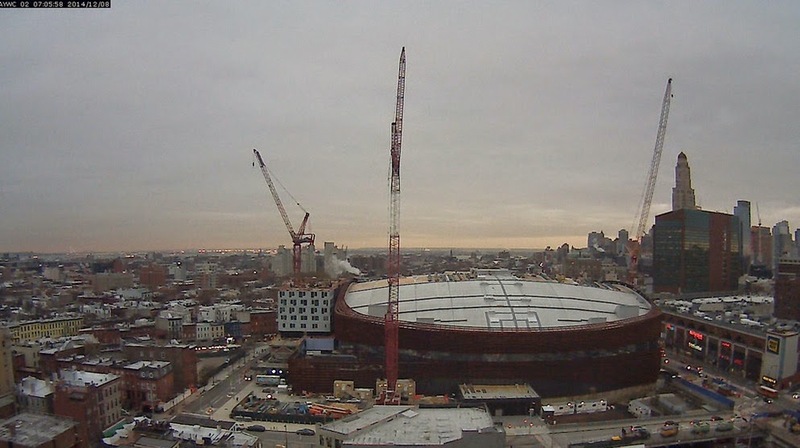 Ratner's share of Barclays Center expected to sell at profit, and only in part. In ESPN's Ultimate Standings, Nets nudge back but still lead Knicks by large margin. In federal lawsuit filed by trainees “promised” Atlantic Yards construction jobs, judge leaves Forest City on potential hook. After "mob" rushes front doors to Barclays Center, arena closes entry to Powerhouse 2014 hip-hop show. Forest City seeks "Vice President of Development (Atlantic Yards)." But not Pacific Park? Job Opening: Director, Atlantic Yards Community Development Corporation. Belated notice: for two years, a 16-foot fence plus sidewalk closings at Block 1129 to accommodate construction. Crain's softball interview with Greenland, which also claims U.S. projects funded via EB-5 have "created 20,000 job." 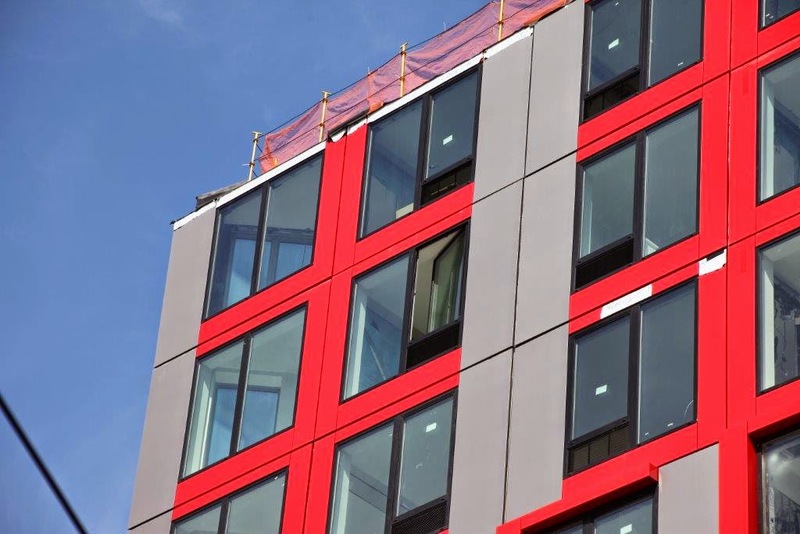 Forest City buys out Skanska's share of troubled modular factory. Forest City Enterprises says stalled B2 tower: $155 million project cost could increase to $215-$265 million. Forest City's second Corporate Social Responsibility report maintains omissions about dicey issues. As TV deals bolster value of Nets, Prokhorov said to have pressure to sell. Post: Forest City's selling arena to convert to REIT; is ownership at odds with Ratner? Weinstein building, last on Block 1129, under demolition (by Nassau County-based WBE). At the Quality of Life meeting: dismay over parking, new buildings well-received, update on new Atlantic Yards CDC. Jersey barriers for Block 1129 construction narrow streets, snag traffic; were locals prepared for loss of parking? Forest City says re stalled B2 tower: "Any alignment issues that may exist… is an easy fix." Conventional wisdom: Philly leads Brooklyn for DNC because of swing state, security perimeter around Barclays Center (would businesses close?). Cash receipts for Barclays Center show $11 million drop in ticket revenues between Q3 of 2013 and Q3 of 2014. State official Kenneth Adams meets reality: traffic on Atlantic around Barclays Center crane "a mess." As ESD board meeting, Dean Street residents ask for new conditions to improve construction oversight. Inside/out, two different views of belatedly open Sugar Factory at Barclays Center (plus departure of Let's Yo!, Kaz An Nou, Marco's). Extended fencing/barriers for construction on Dean Street cause huge bottleneck, conflict with operating businesses. Post scoop: AEG offer for Barclays Center below Forest City ask, claimed arena value. Filling the arena? Big discounts for Nets games and Barclays Center events. "We are Brooklyn"? Barclays the place for royal meeting, Garner protests, Nets' lost opportunity. Dirty secret behind Brooklyn's DNC 2016 bid: likely major impacts to area around Barclays Center, as Charlotte example suggests. News? WPIX moving into street-level studio on Flatbush side of Barclays Center, forming "strategic partnership." Before 535 Carlton groundbreaking, new web site promotes "Brooklyn's newest neighborhood," avoids specifics on "impeccable" affordability? Unbuilt condos already being marketed to Chinese buyers. In campaign, de Blasio touted affordable housing at $1,000-$1,500 a month; that's not the case with next Atlantic Yards towers. Atlantic Yards construction trumps accountability: new AYCDC delayed until January 30, six weeks after groundbreaking. Year of the Sheep: at groundbreaking for new tower, de Blasio and supporters hail "100% affordable housing," avoid pesky details about cost. Promotion for the "Chinese Government." Greenland press release touting "high-end" 550 Vanderbilt condo building gets wide play. Four-year modular buildout: Forest City says B2 tower would be completed at end of 2016, says "same technology" is fine. New Downtown Brooklyn Partnership video touts 2016 DNC bid, steers clear of Prospect Heights. A green-roof related accident stalled the Nets-Heat game with leaks onto the court. Curbed declares B2 the "Most Pathetic Building of the Year."